Thank you to Hasbro for providing me with complimentary products for this review and giveaway! This post contains affiliate links. I have to be upfront – I grew up in the 1980s, but I never played with a Transformer, not once. I was more of a Barbie/Strawberry Shortcake kind of kid. But my 8 year old daughter has much broader interests than her mom – she loves unicorns & superheroes & princesses and just about everything in between. 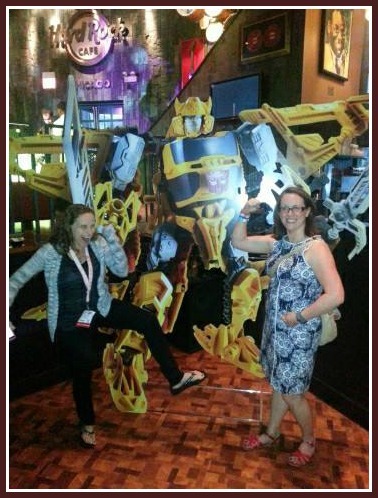 This past summer, she discovered the original Transformers cartoon series on Netflix. She liked it so much that she picked out a Transformers backpack for her second grade school year. 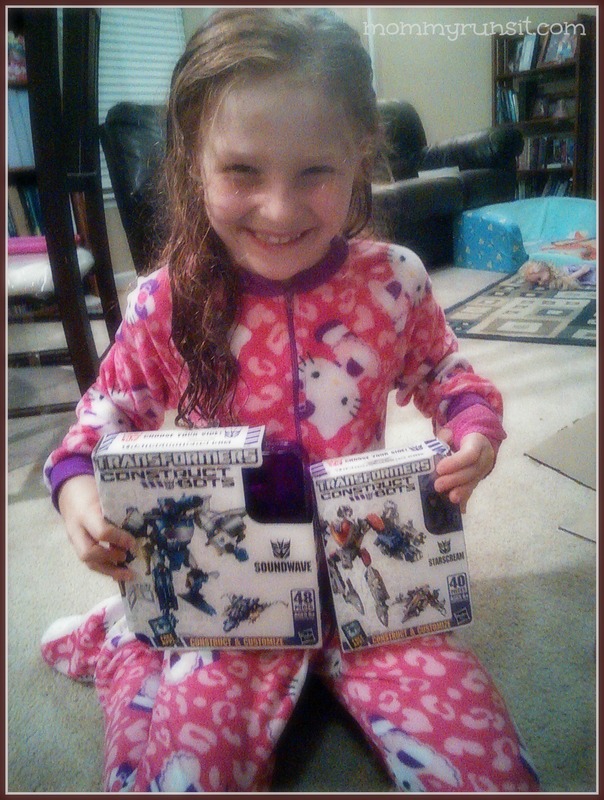 Needless to say, she was ecstatic when she found out that we would have the opportunity to review two of Hasbro’s newest products – a Transformers Construct-Bots Scout Action Figure Set and a Transformers Construct-Bots Elite Action Figure Set. The Transformers Construct-Bots Scout Class Starscream Buildable Action Figure is for ages 6 & up and retails for approximately $9.99. It comes with 40 pieces and instructions. The Transformers Construct-Bots Elite Class Soundwave Buildable Action Figure is also for ages 6 & up and retails for approximately $14.99. It comes with 48 pieces, a storage tray, and instructions. The Starscream figure can be assembled as either a robot warrior or a fighter jet, and the Soundwave figure can be constructed as either a robot warrior or a tape player – you choose! Once your figure is built in one mode, you can convert him to the other mode or tear him down and rebuild him. 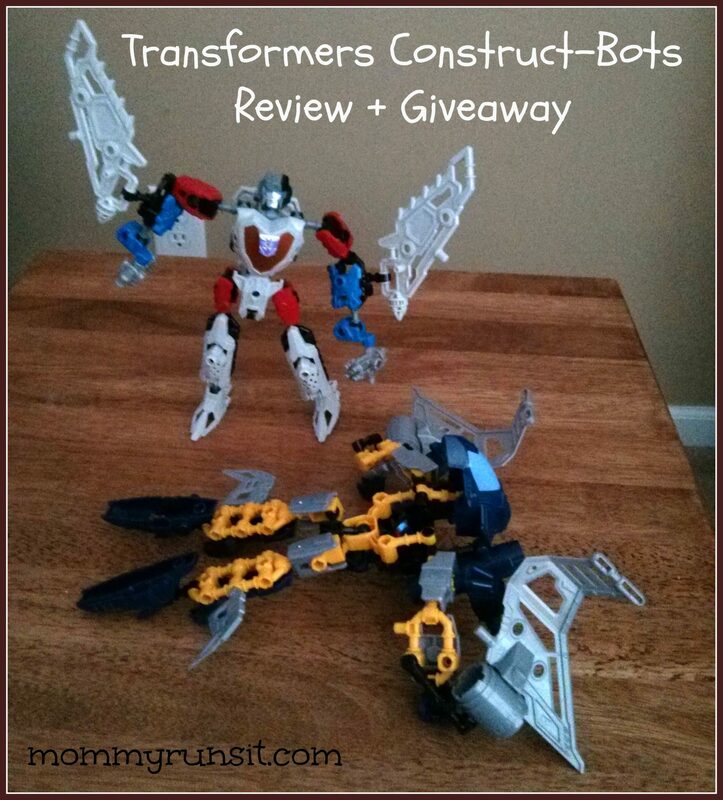 Given my lack of experience with Transformers, plus my habitual clumsiness when it comes to putting things together, I asked my husband to review the toys with our daughter. What do you think of the Construct-Bots? I think they’re great. They seem well-made and the finished product is really nice. Is there anything you didn’t like or would change about them? I think they are a little complicated for a child to put together. But it was fun helping her putting them together. How much of the assembly was she able to do on her own, and how much did you have to help her with? It was probably about 50/50. Are the Construct-Bots anything like the Transformers that you remember playing with as a kid? No, not really. The old ones didn’t need to be assembled. It’s different that you can change them into different things too. Do you think that the Construct-Bots are reasonably priced? Yes. They are relatively inexpensive, given the quality of the toy. What do you think of the Construct-Bots? I like them a lot. My favorite one is Soundwave. I like their names. What do you like most about them? I like the colors and that they have toy weapons. Is there anything you didn’t like or would change about them? No. It would be cool if one of them could transform into a motorcycle. Were they hard to put together? A little. Who would these be good presents for? Me and my friends. The boys who are my neighbors would like them a lot. And some girls might like them too. My absolute favorite thing about the Construct-Bots was getting to watch my daughter & her dad work on a project together! They truly had a lot of fun. I was also pleasantly surprised by the price – at around $10 – $15 each (a little more for deluxe sets), they would make perfect birthday presents. They do come with a whole lot of little pieces (the bane of many a parent’s existence, I know) but if they are constructed as soon as they come out of the box, the little pieces really shouldn’t pose much of a problem. I’m not particularly worried about finding little Transformer bits jammed into my heel in the middle of the night. The instruction manuals were a little daunting, but my 8 year old managed to put each one together in about 20 minutes (with help from her dad). I should mention that she has very little experience with Legos or other toys that require assembly with lots of small pieces – so I was proud of her for doing so well with the Construct-Bots. She didn’t get frustrated or quit, and I think it was because she was so excited to see the finished products. The bottom line? 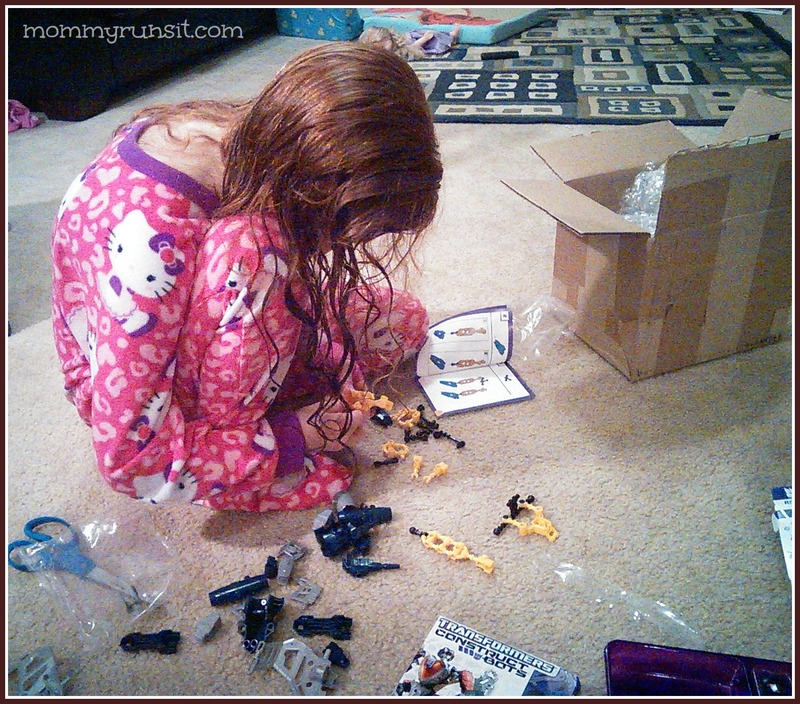 We love the Transformers Construct-Bots! They are high quality toys at a great price. Just remember that you’re going to need to set aside some time to assist your child with assembling them, especially if he or she is on the younger side and/or inexperienced with this type of toy. And now I get to give one of my readers a Transformers Construct-Bot of their own! Hasbro will send one lucky winner a Triple Changer Set (approximate retail value $24.99). Just enter on the Rafflecopter below. Good luck! Read about more great Hasbro products here: BEJEWELED & TWISTER Game Night Party. I love Transformers. That movie brings out the kid in me. Actually, just the other day I had a marathon and watched all the movies. Elite Class Shockwave Buildable Action Figure, the purple one is my favorite. Colby loves anything having to do with Optimus Prime. My favorite is the Transformers Construct-Bots Elite Class Optimus Prime Buildable Action Figure. Soundwave looks pretty awesome! I bet my brother would love it! Pretty neat! I love the different perspectives 🙂 My little brother loves transformers! I am definitely going to enter the contest!